In the early 1970s, Dr. Greenspan said it was our relationships and our ability to think and communicate that allows us to develop into successful, adaptable and self-aware adults. Meaningful interactions and social experiences we have throughout our lives drive that growth. Unfortunately, we, as a community, seem to be having less and less of these meaningful conversations. It's time to put down the phones, pick up the cards, and have fun and meaningful conversations. Remember, the conversation itself is the goal. Having a fun conversation builds a relationship. Conversing about our opinions, wants and feelings help us become more self-aware and analytical. Reflecting on and organizing our ideas helps us become higher-order thinkers. 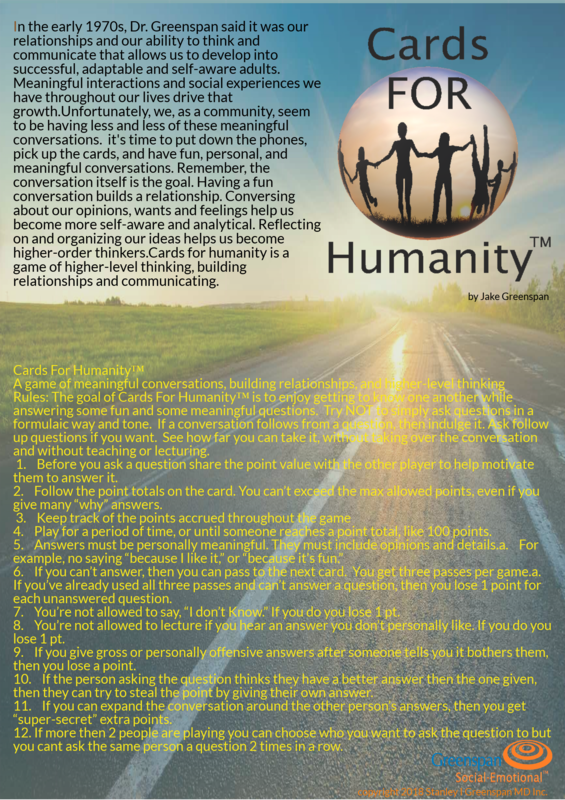 The goals of the "game" are to enjoy getting to know one another while answering some fun and some meaningful questions. Try NOT to simply ask questions in a formulaic way and tone. If a conversation follows from a question, then indulge it. Ask follow-up questions if you want. See how far you can take it, without taking over the conversation and without teaching or lecturing. Order your pack of 108 cards and many more meaningful questions today. Choose from 108 cards and ask each other fun and meaningful questions. Get points for each meaningful answer and by expanding on your answers.